Let BDP Cater your Next Event! Celebrating something special? For more than two decades, Big Delicious Planet has been catering galas, cocktail receptions, showers, anniversaries, birthdays, and mitzvahs at Chicago venues, in homes, offices, and galleries. We have worked at venues all across the city and apply our experience from hundreds of events to ensure that all elements you envision happen seamlessly. Our team will work with your vendors to ensure that all planned elements are carried out in your timeline, and that the floor plan and menu are executed to perfection. With our own urban farm just steps from our kitchen you'll be proud to have a sustainably focused menu that includes produce harvested hours before your event. BDP is fully licensed and can source local + sustainable wine, beer and spirits. We are well versed in vegetarian, vegan, gluten-free, and global cuisine. We’re proud to work closely with some of Chicago’s coolest, creative, sustainably focused vendors. We are happy to connect you with a florist sourcing locally, a photographer, live music, or a vintage rental company. Need a little guidance? We're happy to help! Start by checking out our vendors + venues page here. form below and we will be in touch! Our events range from $80-$120 per person for food, staff, rentals, and bar service fee (mixers, ice, garnishes, and insurance). We have a $1,500 minimum for weekend events. Host your next event at Big Delicious Planet! 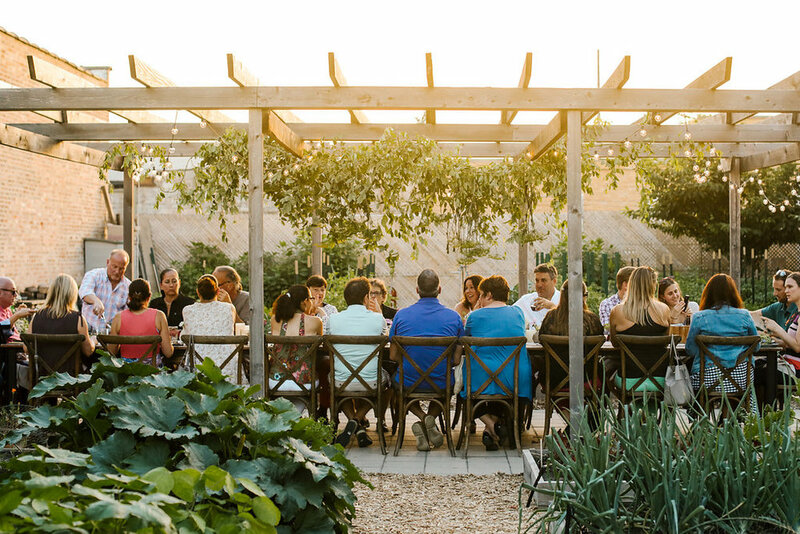 BDP's Canteen and Urban Farm are perfect locations for small seated events for up to 24 guests or cocktail-style parties for up to 60 guests. The Canteen is available year round, and the Urban Farm is available June through September. We've hosted bridal + baby showers, rehearsal + corporate dinners, and fundraisers in both spaces.